Perhaps "fulfilment of a dream" is putting it a bit strong, but I have wanted to visit the FAC Nationals in the USA for many years, and this year I finally had the chance to go. 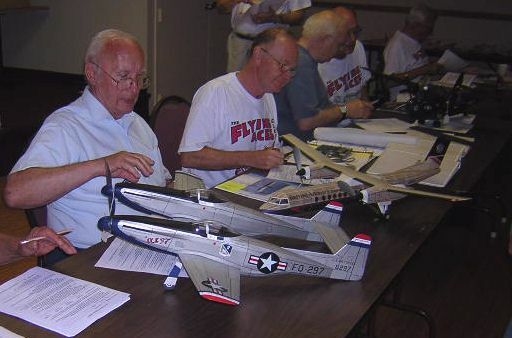 "The Flying Aces Club is a society of unique individuals with a common interest that at times borders on a passion. 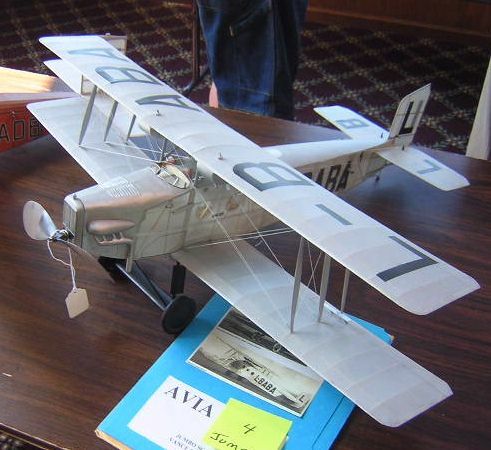 It is our intent to preserve and promote the traditional building and flying of free flight stick and tissue model aircraft. Although competitive at times, the sharing of innovations, assistance and comeraderie is second nature to all who believe in the spirit of the FAC. Build! Fly! Win!" Every two years they hold a three day National Championship at Geneseo in New York State, with a multiplicity of events (around 40 different classes), some directly against the clock, some mass launches where the first models down are eliminated before the following round. 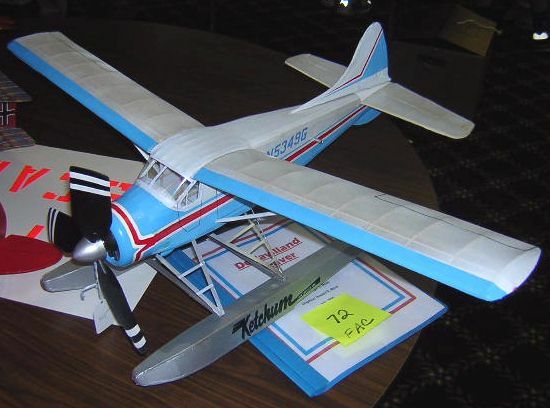 The emphasis is very much on flight times, though some classes are statically judged, and bonus points awarded for tricky or unusual configurations. I guess the nearest event in charactor that we have in the UK is (not surprisingly) the Peterborough Flying Aces meeting every September, though this is not quite on the same scale! Obviously, one of the main concerns in travelling across the Atlantic to a model flying event is how to get the models across safely. 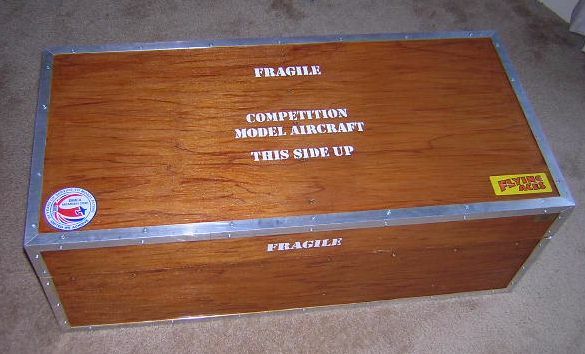 A custom built model box seemed to be the only answer as I needed to get a 32 inch span wing in there, and still comply with the size limit imposed on transatlantic flights of 62 inches when all three dimensions of an item of luggage are added together. I designed mine to be 34 x 16 x 12 inches, so right on the limit. Construction was 1/8" ply with an internal frame of 20 mm x 20 mm pine. I bought some Aluminium L section to protect the corners, and make it look nicer. It would be fair to say I got a bit fed up of cutting all those 45 degree angles with a hacksaw! The lid is not hinged, but there are a couple of over centre fasteners to keep it shut, and I used two luggage straps around the outside just to make sure it did not open mid flight. The inside is something of a 3D jigsaw which I sort of made up as I went along. The models are supported by expanded polystyrene blocks cut vaguely to shape, and glued to the inside of the box. Loose elastic bands attached to hooks screwed into the box frame were used to keep the models in place, as well as further polystyrene blocks pinned to the lower ones with cocktail sticks and barbeque skewers. 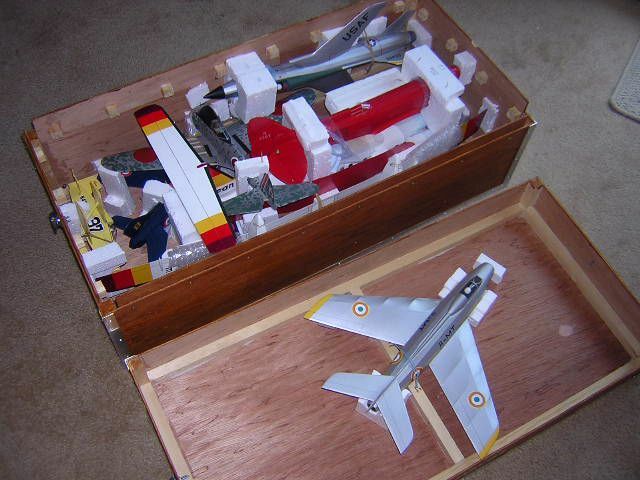 With six models in place, I reckoned there was room for one more jet in the lid, and happily there were no nasty crunching noises when the lid was tentatively fitted for the first time! Incidentally, this photo was taken just before the flight home, so you may spot some damage on the Oscar wing. At the risk of embarrassing him, a big thank you is due to Clive Gamble at this point, as he very kindly volunteered to not only to put me up at his house before and after the event, but also drove me around everywhere. This was greatly appreciated, and contributed greatly to making the trip so enjoyable. I flew into Boston on Tuesday afternoon, then after a rather short night's sleep we were up bright and early on Wednesday morning for the trip across to Geneseo, some 430 miles west. Almost the entire journey was in torrential rain, which to be frank, was a little disappointing! As we got nearer Geneseo itself, it did get a bit brighter, and the rain eased off. After checking into the hotel, we drove hopefully down to the famous field that I had seen so many pictures of, to find a group of flyers sheltering from the drizzle under the tailgates of their cars. As would happen many times over the weekend, it was great to finally meet in person many modellers with whom I have exchanged e-mails over the years. I have to say that the scale free flighters in the USA are just as friendly and welcoming as those in the UK. It must be something to do with the nature of this marvellous hobby I guess! Anyway, after hanging around in the rain chatting for a while, a tactical withdrawal to the hotel was suggested, and new models were paraded, passed around and discussed, and of course the odd beer consumed before going out for a splendid meal at a restaurant in town. Thursday is not an official competition day, but is used by many for trimming and general fun flying. The day started off damp, so breakfast was leisurly, but then there was a general migration down to the field. The sun soon dried out the grass, and winds were light, so very pleasant flying and trimming conditions. Scale jet enthusiast Marty Richey, whose models you may have seen in the Rapier Gallery pages, was making his first trip to Geneseo as well this time, and he kindly offered me a place under his canopy for the duration of the event. Marty had brought his entire jet fleet with him, so between us we got through an awful lot of motors over the next four days! Due to the excellent weather conditions, Thursday was a good chance for people to put in a quick flight to check out whether a model had held its trim settings since last time, or to try and sort out a new model. The event starts proper with the scale judging back at the hotel on Thursday afternoon, and this time the jumbo and giant scale models were on display together with the models from the other classes (for the first time I gather). 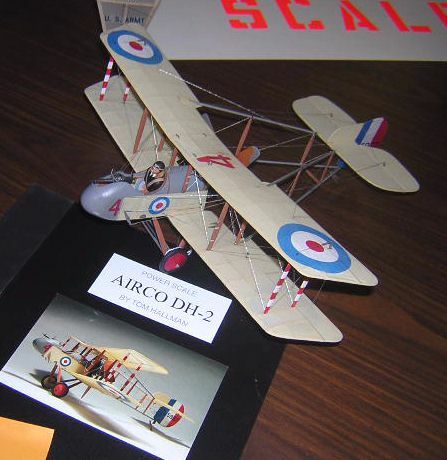 There was also the new jet scale class, thanks to the sponsership of Shorty's Basement. 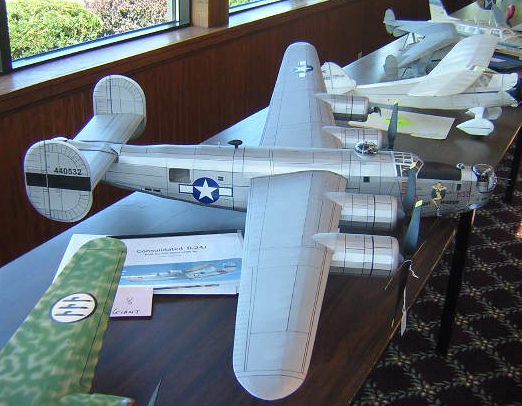 Undoubtably one of the stars of the show was Chris Starleaf's 60 inch span rubber powered Consolidated B-24. 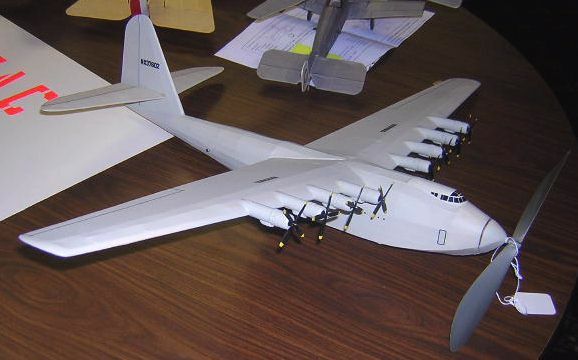 The model features separate motors in each nacelle, and four plastic props all going the same way round. 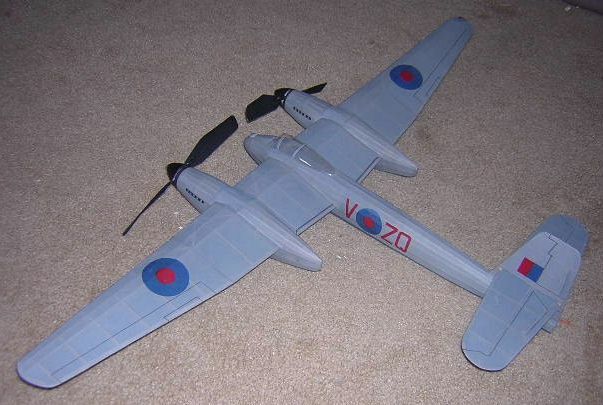 Vance Gilbert was the builder of this beautifully finished jumbo scale Avia BH 25. Unfortunately it was wrecked in a crash later during the contest. 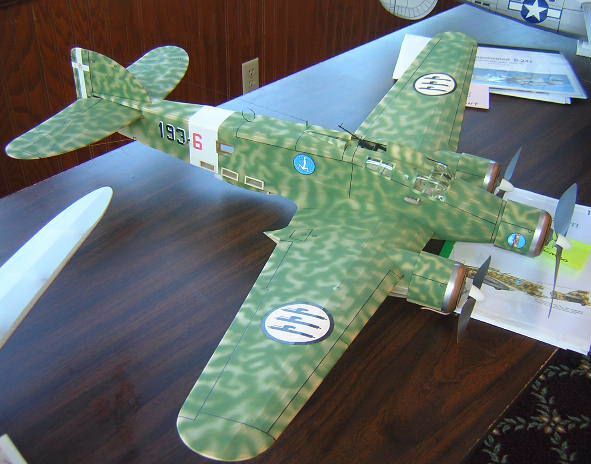 This lovely twin rubber Lockheed YP-38 was from Mark Fineman. 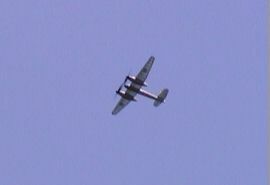 I saw it flying very nicely over the weekend. 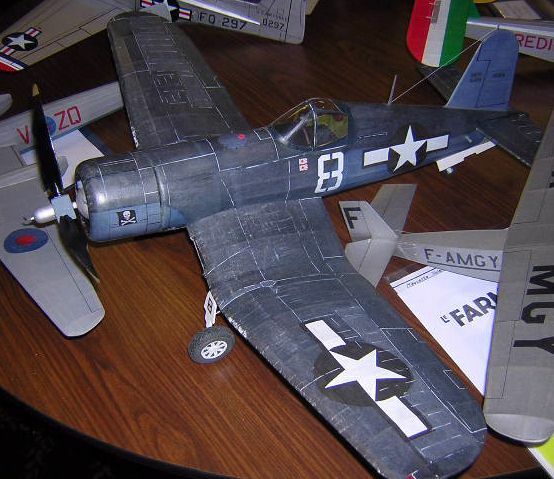 Many of you will have heard of Mike Midkiff (aka Iron Mike) through his excellent range of plans, and here is an example of his handiwork - a very impressive F4U Corsair. 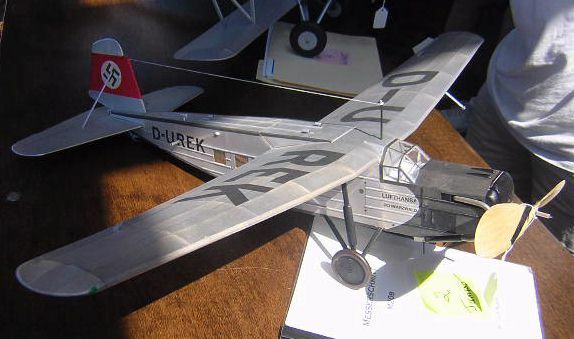 Jack Moses built this fine flying jumbo scale Messerschitt M.20B. On one flight it managed to get its prop tangled in a mylar streamer at the tip of a pole, and had to be gently lowered to safety. Tom Hallman's latest masterpiece, built for this year's event to his usual high standard, was this Dornier Do X in Italian markings. 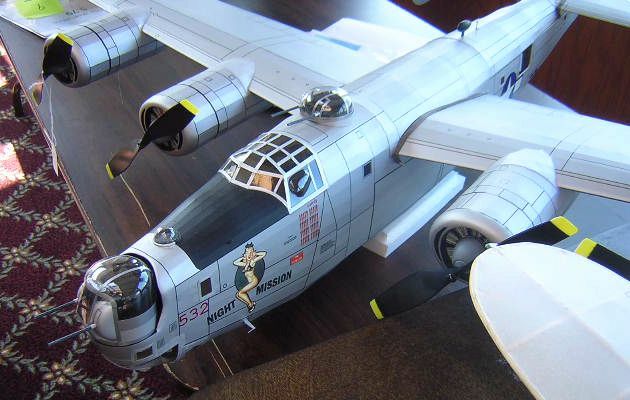 The model is rubber powered using a single large prop, which you can see to the right of the model. 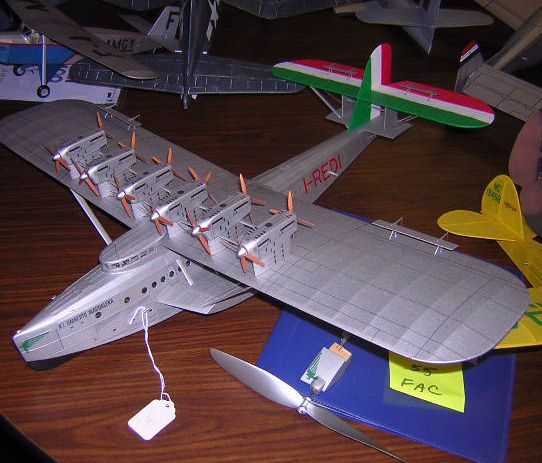 Someone else with a similar idea was Vic Nippert with his Hughes HK-1 flying boat. 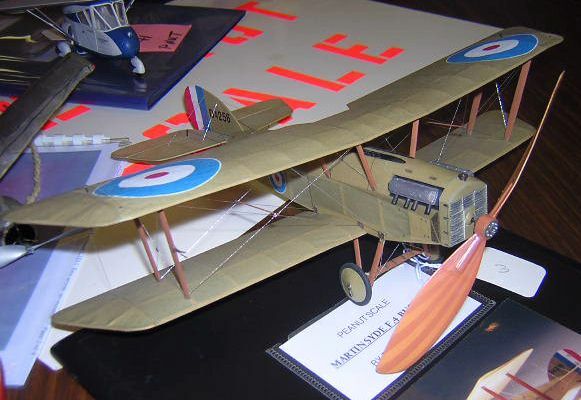 This is Rich Weber's magnificent 1/12 scale Bristol Scout Model C, built from the new Thomas Designs kit. The photo does not do any justice to the amount of scale detail incorporated into this model. 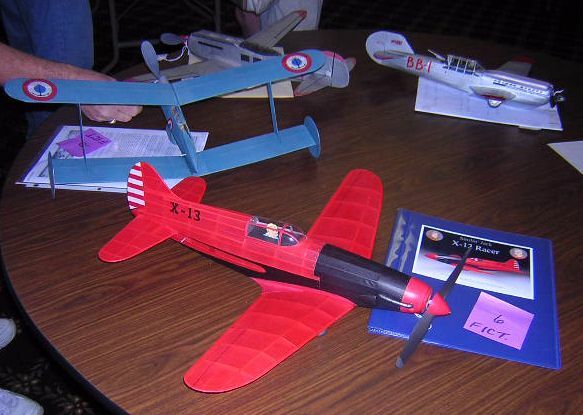 The model was test flown over the weekend, but not risked in competition due to the wind on Saturday. I was rather taken with this neat D.H.C. Beaver on floats. The builder was Roger Moon from Texas. The judging team put in sterling work on the Thursday afternoon and evening. 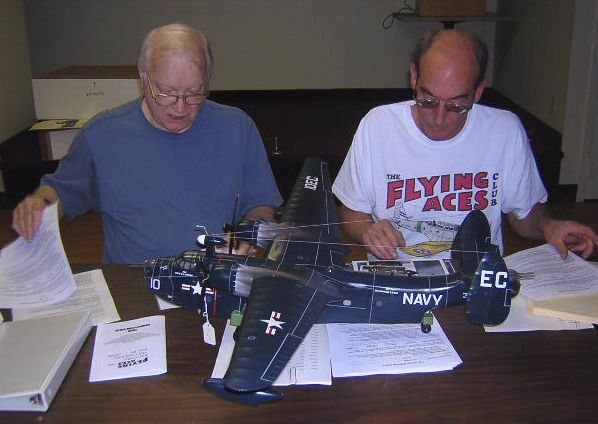 Here are Ralph Kuenz and Paul Boyanowski giving Bob Bojanowski's twin electric Martin Mariner the once over. And here are Chris Starleaf's rubber powered Twin Mustang and DHC Dash 8 being inspected by Jack Moses and Pres Bruning. 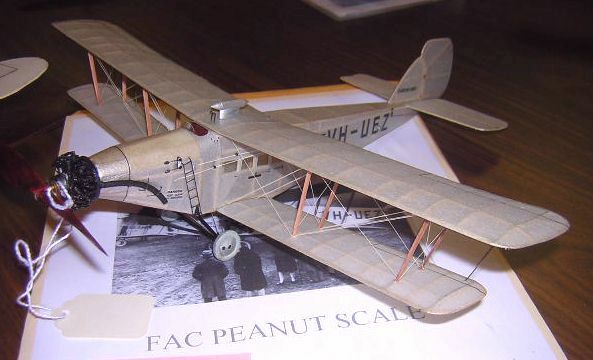 Tom Hallman entered this neat Martinsyde Buzzard in peanut scale, a WW1 type with excellent proportions for free flight. 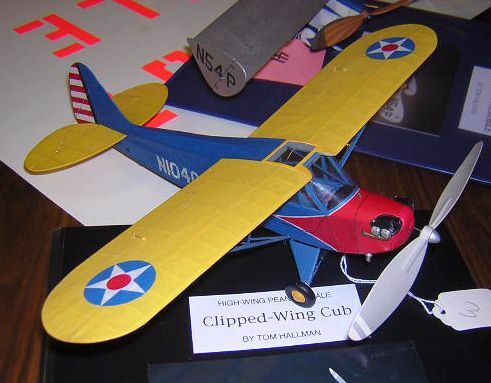 Another of Tom's entries was this colourful clipped wing Piper Cub, for the high wing peanut class. A very unusual subject, beautifully rendered by Tom for peanut scale, was this delightful Waterman Aerobile. I am told that this portly peanut, entered by Marcy Green, is a Sage type II - a most interesting looking machine, and a new one to me! 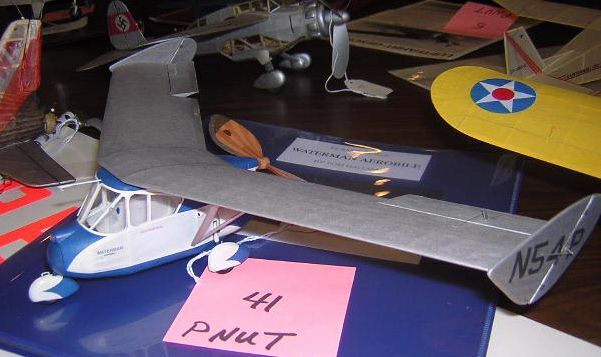 Vance Gilbert built this delightful peanut scale Anec III, which was untrimmed before the event. He had great trouble getting it to fly on Friday before he accidentally ran over it with his car. After fixing it, the model had a change of heart and started to behave! Tom Hallman's exquisite D.H.2 is electric powered, using a Kenway motor and LiPoly battery, and was entered in the power scale class. 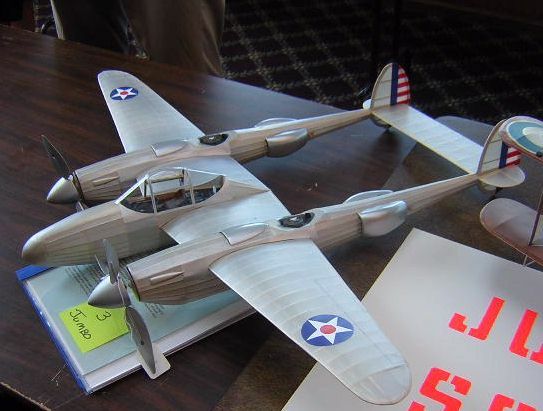 Tom also entered the Fantasy Flier class with this sleek X-13 racer. Behind you can see Rich weber's Mystery Tailless in French Navy markings. This is a pretty rubbish photo I know, but at least it shows the entries for the inaugural jet scale event. 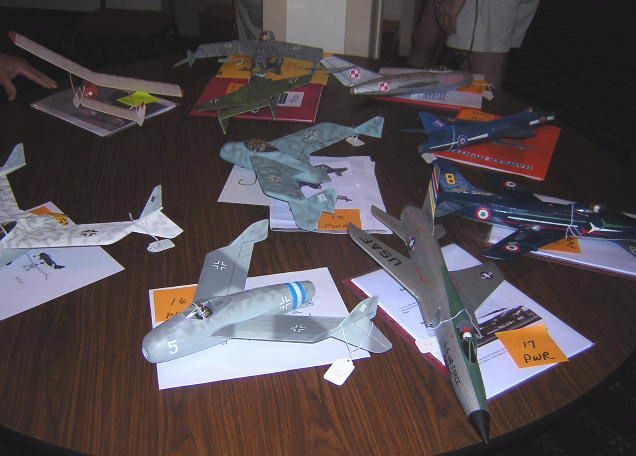 All the models shown used Rapier motors of various power ratings. 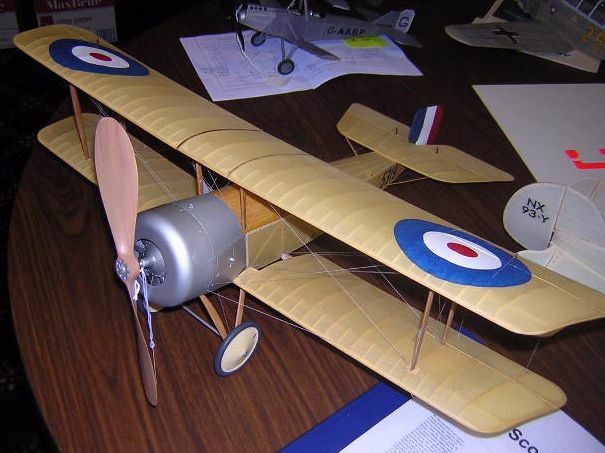 The Blohm und Voss BV P.215 design by Steve Bage was popular, with three of them being entered (plan available here). 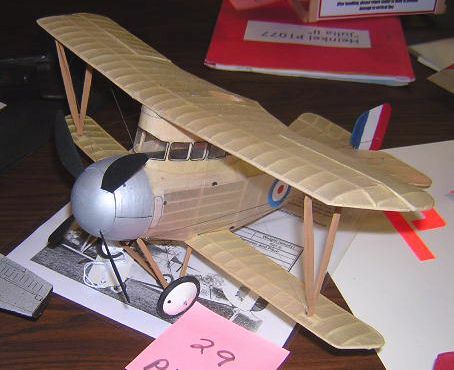 The model nearest the camera is in fact a BV P.212, the single seat fighter version, built by Marty Richey. After spending a long time admiring the models, and doing a bit of shopping from assorted vendors, it was time to nip back to the university campus, where the remaining four nights would be spent, for an evening meal. There was then still time to head back to the field for some late night flying before the light faded.